Digital Printing and, in particular, wide-format digital printing, is a staple production technology used throughout the signing and allied industries. Digital printing hardware typically comprises apparatus having a means to hold, transport and wind a material suitable for printing. The apparatus also has an ink storage means and a number of ink delivery means, usually known as print heads. A typical wide format inkjet printer will be a four-colour device. Usually each of the four-colours is printed through a print head dedicated to a single colour. The four colours comprise the SWOP or standard four colour model – Cyan Magenta Yellow and Black. Wide format inkjet printers are known that feature elaborations based on the standard four colour model making the printer faster or capable of producing smoother gradation or more colours. The inks used, when printed in tandem with a suitable material are known to be durable. Several ink species are known and some can be printed direct to flat sheets of rigid material. 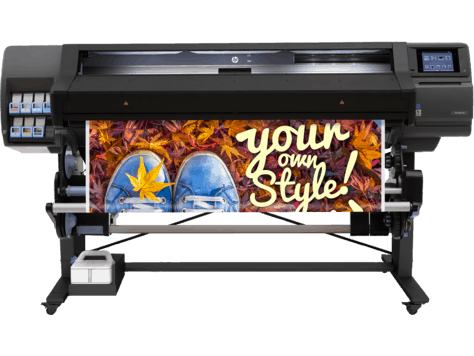 The materials used in a typical wide format printer for digital printing will include self adhesive materials, banner materials, window graphics materials and poster or transparency material among many others. Such material give digital printing a very broad remit in terms of the applications to which it can be applied, hence its near ubiquity in signing. Digital printing requires no hard origination steps unlike printing processes including screen process printing, flexographic printing, lithographic printing among others. This means that digital printing is both practical and affordable when the needs for the output result in low volume. The suitability of digital printing for high volumes is becoming more practical as speeds increase and costs continue to fall.